My husband and I went out to dinner with friends. They suggested The Village Inn, Fairlie, Scotland. I knew nothing about it. so was happy to go with their suggestion. However, my husband knew this restaurant of old. He was dubious about their choice. The restaurant had been closed for over a year before the present owners took it over. They have carried out an extensive refurbishment. 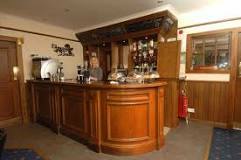 The result is a warm, welcoming pub and restaurant with an extensive menu, a good wine list and polite, friendly staff. Access for disabled people is good. The portions are generous and the food very tasty indeed. For starters one of our friends chose garlic mushrooms and the other had prawns. My husband had a chicken starter while I had tempura vegetables. All the plates were cleared as the dishes were delicious. Our main courses were equally good. We chose fajitas, steak pie, chicken and fish and chips. All the meals were delicious and the portions generous. The restaurant was very busy the evening we were there. They had a large party celebrating a 90th birthday. Despite this, the waitresses and the owner made sure we were not kept waiting unnecessarily. However, we were glad we had made a reservation. We all made room for deserts. Two of us had cheese cake and the others chose ice cream. We all had coffee. We chatted so much we were almost the last table to leave the restaurant, the staff never rushed us or made us feel awkward. As access at the Village Inn is easy for disabled people, I look forward to taking my mother there. This restaurant was a great find. I will look forward to using it again. This is a really good little pub/restaurant. I do like the brunch they do! I’ve often thought of trying this restaurant and find your comments very encouraging. A great favourite of ours. Never been disappointed.